An alien (Aamir Khan) gets stranded on earth with not a stitch on him except a locket which was his remote to call the spaceship to go back to his planet.A� When the locket is looted from him he is unable to leave. There begins PKa��s journey, and his interaction with Jaggu Janani (Anushka Sharma) which later stems into love.A� Slowly he understands the use of money , clothes and ends up unraveling a case of corruption that had seized the country. But will he be able to make this planet his new home? Aamir Khan’s character is shown as to be obsessed with Indiana��s chewing Paan. To get into character, he ate 100 a day and which adss upto 10,000 during the filming of the movie. Two years after the Autobot save the Earth from the Decepticons, Sam Witwicky (Shia LaBeouf) faces a battle called college life. 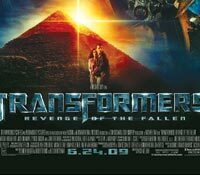 Meanwhile, the war between the Autobots and the Decepticons continues.A� Picking up where the first film left off, this action extravaganza finds the evil Decepticons regrouping with a deceitful new plan to destroy the world. It’s up to college-bound Sam to help Optimus Prime and the Autobots to save the day. Megan Fox cannot ride a motorcycle, so when she shot her riding scenes someone had to push her so that she could get a good start, and when shooting ended someone was always on hand to catch her bike. Cast: Shah Rukh Khan, Deepika Padukone, Abhishek Bachchan Six underdogs from various walks of life come together to fulfill Charliea��s (Shah Rukh Khan) big dream. The first hurdle is to be shortlisted in the finale of an international dance competition. Enter Mohini (Deepika Padukone) a bar dancer. But the dancer doesna��t realise that the real reason behind Charliea��s plan is a robbery and revenge. Deepika Padukonea��s character name was inspired from Madhuri Dixit’s character of in Tezaab 1988. Her entry in the movie is also similar to Madhuri’s in the movie.